We all crave the smallest and most portable things these days, everything has to be pocket-sized so we can take them everywhere with us, our phones, laptops and now our e-cigs. Sigelei have come up with this nifty device which can come in too different models, providing several options for those who are unsure as to what they are looking for. The Zmax V3 also comes with a telescopic body, not something you see on every device nowadays, but always a great addition for users. Sigelei have put a lot of effort into ensuring that this piece of equipment is a well-designed and reliable device, giving consumers the best possible product for the price. A mediocre 3 stars for the Zmax V3 E-cig isn’t the be all and end all, there are of course good and bad features, which I will gladly explain further on. 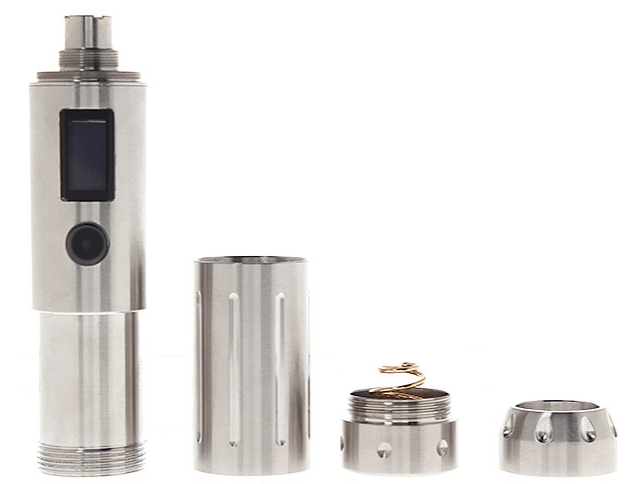 The Zmax V3 is designed to be a versatile, uniquely designed and high quality product, giving users the ability to pick and choose their specific model and get a truly personal experience. The already mentioned telescopic feature shows that Sigelei are aiming to provide the market with a device that is of a very high quality and more than desirable design features to prove why you should upgrade from the V2 to the V3. Sturdy And Reliable – The Sigelei Zmax V3 is one you can rely on. It is built with care, and its stainless steel casing shows the reliability you can trust when you buy from Sigelei. The vaporizer is also very easy to use, perfect for those who are new to the world of vaping or are looking to upgrade for the first time, providing a smoother overall experience. Multiple Designs To Choose From – As previously mentioned, Sigelei are offering the Zmax V3 in a variety of designs. You can choose from the regular version or go for the new and improved flat-top version. There are differences along with positives for both designs, but you can guarantee that you will receive a well-rounded device. Overall Outstanding Performance – The V3 model now offers users the chance to go from a single 18350 model to a dual 18350 model, by using the twisty feature. This means that by the simple twist of one of the parts you can literally expand the area for a variety of batteries, giving you a longer life. The quality in terms of performance really comes into play when you use the Zmax’s dual battery feature. This gives you the chance to have a higher voltage, leading to a better vaping experience. Price – Price is always big one when it comes to reviewing a product. I genuinely feel that the $80 price tag on the V3 is well worth it, whether that be for beginners or for experts! Sigelei give users the choice to have a personal experience, by choosing the type of design and the option to use single or dual battery mode, something which isn’t common in e-cigarettes. Not Quite As Small As Thought – Now, I did start this review by saying that this product was small, but looking back it does look and feel slightly bigger than I expected. Even the smallest setup seemed to stand out and wasn’t really ideal for the pocket sized expectations I had. Sigelei Zmax v3 Battery Problems – The Zmax V3 is rather keen on using a specific type of battery, you will need to use IMR batteries as the regular and widely used lithium protected batteries don’t seem to work here. I also found that some of the smaller battery sizes can cause issues as they seem to lose connection and actually reset the device on some occasions. Not Completely User Friendly – Whilst the Zmax V3 E-Cig is a great option for everyone, it does have a rather complicated to use interface and some people may have issues whilst trying to use it. You need to follow certain steps to get you to where you need to be; somewhat of a hassle if you are used to a regular e-cigarette. J80 – Half the size of an iPhone 6, this device really is small and compact. This is a battery box with integrated temperature control and the technology to deliver accuracy and out of this world features. ShallowTail 75A – These funky looking designs are actually made from stabilized wood which gives your kit a sense of personality. It comes with a single battery, offering a more than substantial battery life, keeping you on the go when you need it most. For this Zmax V3 review, I found the Zmax V3 to be a really versatile E-cigarette, offering users a unique and personal vaping experience – something we all secretly want. Being able to choose what type of top you want and then being able to choose what battery setting you go on is a small piece of the puzzle but it makes a difference when comparing what products to choose from. Although I believe that this product is great, and especially for the price it is selling at, I do believe that it provides some issues that could really be avoided, such as the fussy battery choices and chances that your device may conk out, mid vape! It’s all a learning game however, and you can’t truly know if it works for you unless you actually try it out for yourself.